Hola babes! Welcome to the inaugural Friday Five! 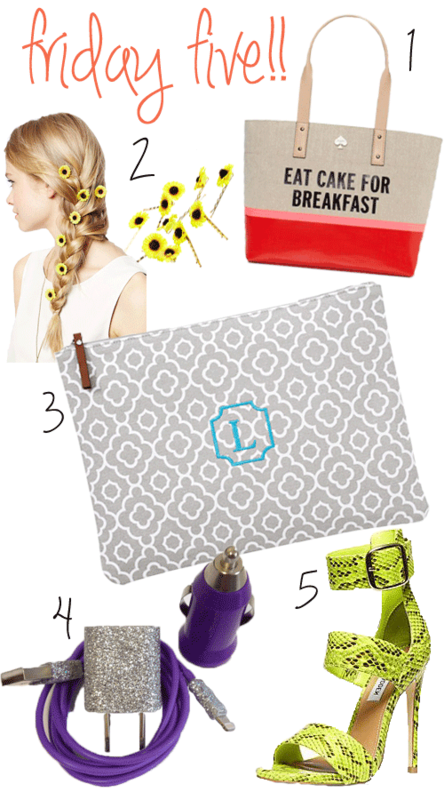 I thought it'd be fun to share the "Top 5" things I'm loving for the week! Be it shoes, handbags, outfits, books, or songs! Whatever I'm lusting after every week! And I think it would be a good way for all of us to collab! I'm going to make it open for y'all to connect and post your "Top 5" as well! Be creative and have fun! Can't wait to see what y'all are loving every week! So hurry and Linkup!! 1: Kate Spade Tote | $198.00 | Kate Spade knows how to make a good bag. All the quirky sayings are the best! I can see myself carrying this bag on trips, to the pool, and out for brunch with the girls! 2: Daisy Bobbies | $15.24 | Braids. Do I need to say more?! The little daisy clips are the cutest and add a little punch to a fun braid! Need to get my hands on these for a cute twist on a summer look! Make sure to check out my Pinterest for tons of braid tips & tricks! 3: Wet/Dry Bag | $16.50 | Wet Bathing Suits. The not-so-fun after from taking a dip. However this super cute Wet/Dry Bag has got you covered. The inside is coated so that you can pack your wet bathing suit and not worry about soaking all the rest of the stuff in your bag! Genius! 4: Car Charger | $21.00 | My cell dies almost every time I'm out and about. I'm in dire need of a car charger. This one is adorbs and the glitter adds a girly touch! 5: Sandals | $129.95 | Strappy Sandals! My summer obsession! This pair is bright & snakeskin! What? So fun! And a perfect touch to your night and day looks! This wet dry bag is genius! I never knew how much I needed something! Great find! I really want those shoes. I love your Friday Five! I love those daisy bobby pins...so cute!! Ah, I missed it this week. Will definitely link up next week! I LOVE those shoes--makes me want a pair for my own closet! Love that Kate Spade bag! My phone always dies too! And I'm loving the glitter on that phone charger, I may just need it! That wet/dry bag is amazing - I love the idea and the pattern!